You should already know by now that GSM voice calls and SMS messages are not secure. Any third party can easily set up a rogue base station and listen to your calls, read your SMS messages, and reroute, drop, or alter any of them. Yes, GSM security is that broken. What you may not have realized yet, is that your GPRS/EDGE connections are just as insecure. Take a look at the following two pictures and try and answer this question: is the smartphone shown on those images connected, via GPRS and via EDGE, respectively, to the network operator "movistar"? Note for those of you unfamiliar with the iPhone: the smartphone in the pictures is an iPhone 3G, which, on the top left corner of the screen, it usually displays the name of the network operator it is connected to, and then, next to it, a symbol representing the type of data connection it has established: a circle, if it is connected using GPRS, or a letter "E", if it is connected using EDGE (or "3G" if it is connected using UMTS). The right answer, sadly enough, is this:"Maybe it is, but then again, maybe it is not". That's the thing: you simply cannot tell! Note: In this case, the Internet connection of the PC was established via ADSL, but we could have used any other access technology like cable, UMTS or even GPRS/EDGE. The above example, in which a user simply navigates to a static web page and the attacker sniffs the connection is a really simple one, granted, but it does illustrate the point: the attacker is sitting between the user's smartphone and the Internet, with full control over any packet flowing between them. Now, think of the possibilities for mischief: the attacker could read any e-mail sent or received in cleartext, she could read any usernames and passwords sent in cleartext by the user to remote servers, she could redirect any outgoing HTTP request to a malicious web server that would then send malicious content back to the browser, etc. Just think about it the next time your smartphone tells you that it is using a GPRS/EDGE connection. Or, if you feel that your data is not interesting enough for an attacker, think about what might be going on the next time the smartphone of your CEO or any other VIP in your organization reports that it is using GPRS/EDGE. Would those connections be interesting to an attacker? Oh, yes! So, what can you do to protect your GPRS/EDGE communications? We'll give you a short answer and a long answer. 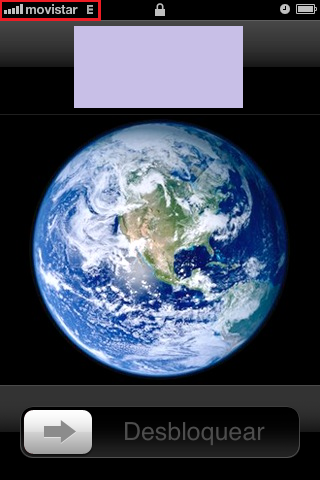 The short answer: Do not use GPRS or EDGE; instead, use only UMTS ("3G", "3.5G", HSPA). Alternatively, make sure you use end-to-end authentication and encryption for all aplications that you access wirelessly. Or, even better, do both. Come to our GSM/UMTS Security training course and you will see for yourself! In the course, we cover everything you need to know about GSM and UMTS security, including voice calls, SMS messaging, and data connections (GPRS/EDGE/UMTS/HSPA). All packed in a very short, very intense training experience, with lots of interactive demonstrations, that will make you fully understand all the vulnerabilities and risks involved and all the countermeasures available. In November 2010 we will be teaching it for the first time, in Valencia, in Spanish, but if you don't speak Spanish or can't make it this time, don't worry: we'll be running English editions soon enough. Follow our blog, tweets and/or web page, and you won't miss it when we announce them. Finally, if you fear that this GPRS/EDGE problem might apply to more than just smartphones, your instincts are serving you well: it definetely does. We will talk about that on a future post. In the meantime, "be afraid, be very afraid..." of GPRS/EDGE connections! This year I had the opportunity to gather the details of the latest vulnerability in Wi-Fi technologies before it's announcement during the BlackHat and DefCon conferences, dubbed "(WPA2) Hole 196", however at that point, I didn't have the time to analyze it and publish the details. I always like to perform an in-depth analysis and share my comments on the current Wi-Fi security threats, as I did during the last years in our original RaDaJo blog with the PTW WEP cracking attack (104 & 40-bit), WEP cloaking, autoimmunity disorder in WLANs or the WPA/TKIP ChopChop attack. (WPA2) Hole 196 couldn't be left apart! My last WPA/TKIP ChopChop attack analysis emphasized the temporary nature of TKIP, recommending WPA2/AES as the reference security technology for Wi-Fi networks. However, the first well-known vulnerability for WPA2-Enterprise has been released. During BlackHat and Defcon 2010, MD Sohail Ahmad senior wireless security researcher from AirTight Networks, presented "WPA Too! ", demonstrating an inherent flaw in the design of WPA(2). Apart from the original presentation, whitepaper, blog post, webinar and FAQ, there is a great analysis by Glenn Fleishman available here. So, let's start this quick analysis emphasizing a security principle the infosec industry does not fully assimilate yet: "If something is shared, it cannot be secret" ;) Hole 196 exploits this principle attacking the GTK, the Group Temporal Key shared by all Wi-Fi clients to exchange broadcast and multicast traffic. 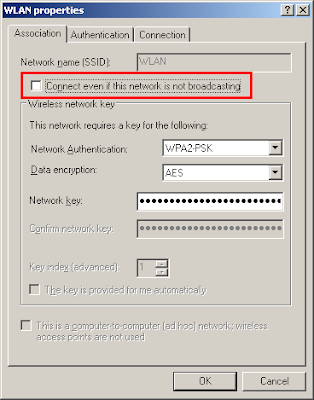 This principle is also what makes WPA(2)-PSK solutions vulnerable, as the Pre-Shared Key is known by all Wi-Fi clients, so any legitimate user can easily decrypt the Wi-Fi traffic from other users. To sum up, I agree with my friend Josh Wright that this new vulnerability won't make people to switch off their Wi-Fi networks (as WEP flaws did a few years back). What makes this finding more interesting is that it affects the most secure Wi-Fi environments nowadays, those based on WPA2/AES-Enterprise (802.1X). To put things in context, there are still thousands, or even millions, of Wi-Fi deployments that are based on WEP or WPA(2)-PSK vulnerable to much more relevant flaws than this one. All WPA and WPA2 environments, independently of the encryption technology used (TKIP or AES) or the authentication method (Personal, PSK or Enterprise, 802.1X) are vulnerable. Hole 196 is particularly relevant on WPA2/AES-Enterprise. Hole 196 is an insider attack, meaning the attacker needs to be a legitimate Wi-Fi user to get access to the GTK. It therefore affects security conscious organizations concerned about the insider threat (unfortunately, still today not everybody is concerned) or the few Wi-Fi hotspots based on WPA(2)-Enterprise (where other legitimate users are not trusted users implicitly). It allows stealthier ARP poisoning (MitM) attacks, as the malicious ARP frames won't be seen on the wired network segments and, therefore, on a wired IDS/IPS. This could be a good reason for security conscious organizations, already using WPA2-Enterprise, to deploy a wireless IDS (WIDS). 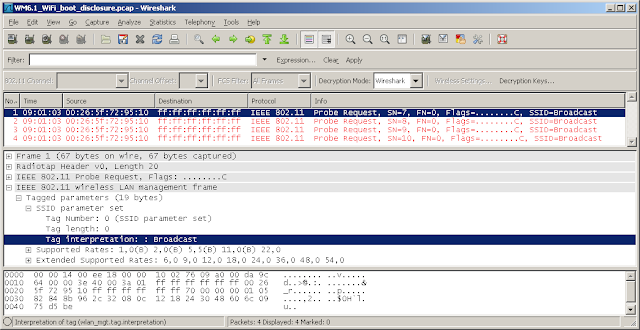 An attacker can use ARP poisoning techniques to get access to (decrypt) other users Wi-Fi traffic, as in a default WPA(2)-PSK setup or wired LAN, manipulate that traffic, or launch DoS attacks. Less-stealthier ARP poisoning attacks are possible on any Wi-Fi network (not just through Hole 196), and quite honestly, still today lots of organizations are unable to detect ARP poisoning attacks on their networks (LAN or WLAN) or even enforce secure wired or wireless network access through 802.1X authentication. A new kind of DoS is possible through Hole 196 by increasing the value of the packet number (PN) field, used by WPA2 to detect replay attacks. This attack joins the long list of Wi-Fi DoS attacks still possible today. In essence, Hole196 allows the injection of fake broadcast or multicast frames in the Wi-Fi network that all users will accept as legitimate. Therefore, an attacker can launch any kind of attack that implies the usage of broadcast or multicast traffic at layer 2, being ARP poisoning the best example. This is what the FAQ refers to as "Other attacks such as port scanning, exploiting OS and application vulnerabilities, malware injection, DNS manipulation, denial of service, etc. are possible by misusing GTK." In the absence of a WIDS, client-based detection capabilities are specially relevant to detect ARP spoofing attacks launched through Hole 196. This opens the door for a future blog post focused on analyzing nowadays ARP poisoning detection solutions on the client side (and in case you ask, Snort is not a client side solution for me), such as arpwatch by LBNL (already analyzed in 2003 on my "Real Worl ARP Spoofing" GCIH paper), DecaffeintID by IronGeek (Windows) or XArp by Christoph P. Mayer (Windows and Linux). What are the solutions available for other Wi-Fi clients, such as mobile devices? Hole 196 has favored new research focused on how the current TCP/IP stacks behave and respond to layer 3 (IP) unicast packets encapsulated in layer 2 (802.11 or Ethernet) broadcast or multicast frames. Josh opened Pandora's box on his Packetstan blog post. Although still it is not clear how this misbehavior can be fully exploited on any network, apart from bypassing layer-2 filters, it is particularly relevant for one-way attacks on Wi-Fi PSPF (Publicly Secure Packet Forwarding, aka "client isolation") environments through Hole 196. 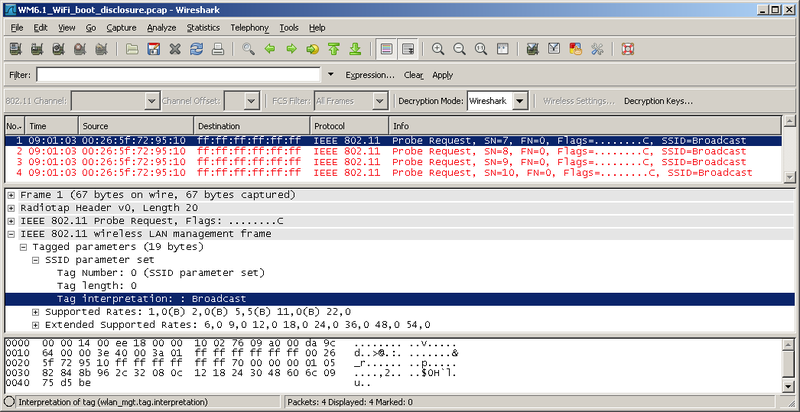 Josh mentioned Windows Vista and 7 accept LAN broadcast traffic sent to unicast IP addresses. I confirmed that Windows Vista SP2 under VMware Fusion 3.1.1 (LAN) in fact does accept this kind of traffic for ICMP, TCP or UDP for broadcast and multicast layer-2 addresses. The most surprising fact is that Windows Vista and 7 accept TCP broadcast traffic. New TCP/IP stack implementations can always include hidden gifts! Linux 2.6 (2.6.30.9), for the records running inside VMware 6.5.4 (LAN), accepts both broadcast and multicast traffic for ICMP and UDP. It rejects it for TCP. From a layer 2 vs. protocol perspective it makes sense, as ICMP and UDP protocols can make use of broadcast and multicast communications, while TCP cannot. However, the key question about this misbehavior is: should the layer 3 address be verified against the layer 2 address by the OS TCP/IP stack before processing a frame/packet? 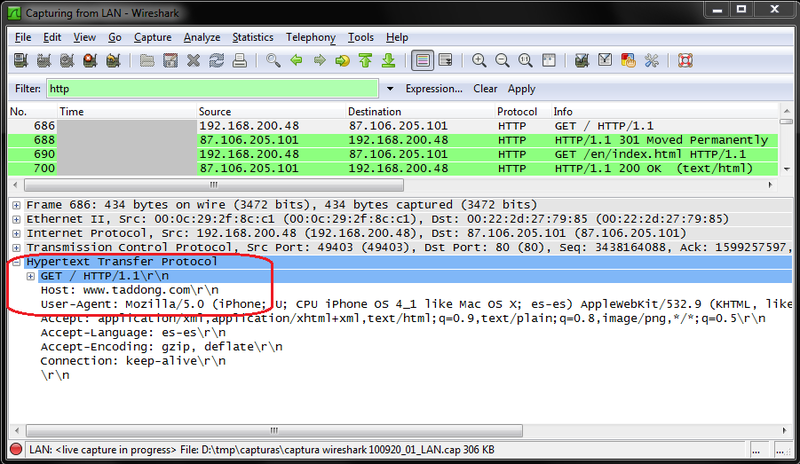 iPhone 3.1.3 and 4.0.2 (WLAN) accept both broadcast and multicast traffic for ICMP and UDP, but rejects both layer-2 addressing types for TCP, like Linux 2.6. Mac OS X 10.6.4 (WLAN) again behaves similarly to Linux 2.6, only accepting both broadcast and multicast traffic for ICMP and UDP. Windows Mobile 6.1 and 6.5 behave as Windows XP, not accepting this kind of traffic for any of the protocols (ICMP, TCP or UDP) no matter the layer-2 address used, broadcast or multicast. If you are interested on testing this kind of misbehaviors, you can use Josh's suggested packet crafting technique based on Python and Scapy (for ICMP, TCP & UDP) on various platforms, including the standard Backtrack 4 Final VM I used for these tests (with Scapy v2.1.0), or a simpler multi-platform method (Windows, Linux & Mac) based on creating a static entry on the local ARP table using a broadcast or multicast layer-2 address, and generating traffic against the associated layer-3 address through ping (ICMP) or netcat (TCP & UDP). NOTE: It would be more secure not to use 196 as the target port (Hint: root level required if port <=1023). For mobile or embedded devices, where netcat cannot be used, you need to identify first an open TCP & UDP port that replies to standard unicast traffic. Remember that for UDP you also need to send a properly formatted packet to the target service in order to force a valid reply (Hint: ARP static entry & "nmap -n -Pn -sU -sV -p5353,137 192.168.100.1"). Definitely, more research is needed if a relevant exploitation vector for this misbehavior is found, including the analysis of both broadcast and multicast packets, covering all interfaces (WLAN and LAN) just in case the TCP/IP stacks behave differently, and considering all kind of Wi-Fi clients such as mobile devices, printers, multimedia disks, etc. Anything with a TCP/IP stack should be part of this extended research. BTW, for the layer 2 multicast address I used 01:00:5e:00:00:01, that corresponds to 224.0.0.1 (all systems on this subnet, IANA). If you test other platforms or have exploitation ideas, please share them in the comments section below, or send me an e-mail. I will cover Hole 196 as part of an in-depth technical look at the current state of Wi-Fi (802.11) security and the still today prevalent and cutting-edge Wi-Fi vulnerabilities and countermeasures, on my "Wi-Fi (In)Security: All Your Air Are Belong To..." talk during the GOVCERT.NL Symposium on November 16, 2010, in The Netherlands. 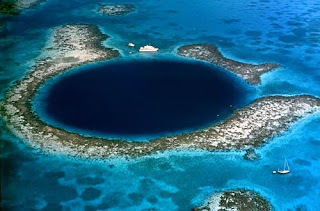 NOTE: The image above belongs to the Great Blue Hole of Belize, in the Lighthouse Reef atoll, a legendary 125 meters deep underwater sinkhole. Windows Mobile manages Wi-Fi (or 802.11) wireless communications through the Wireless Zero Configuration (WZC) client or service, similarly to the equivalent Windows-based desktop operating systems. Windows Mobile, as most Wi-Fi clients, keeps a list of the wireless networks manually configured, plus the networks it has connected to in the past, on the Preferred Network List (PNL). 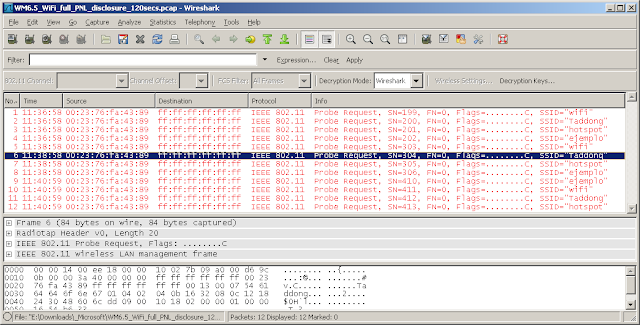 Every time the Wi-Fi interface is turned on, and periodically once it has been activated (for example, to roam between access points), the device checks through 802.11 probe requests what networks in its PNL are available in the current location. Based on the responses obtained, it tries to connect to the most preferred network. 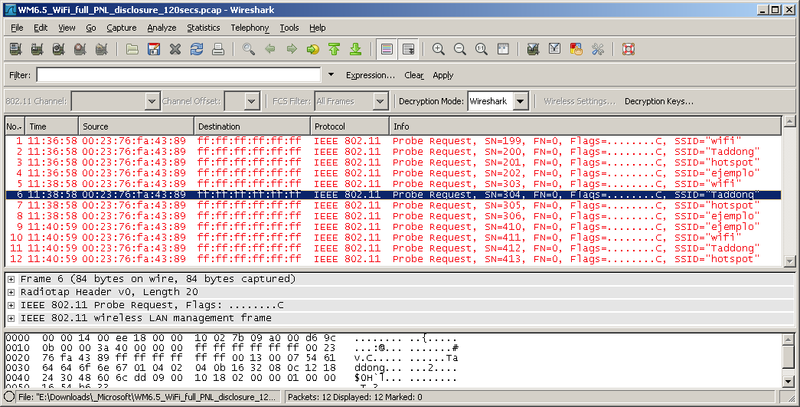 In the past, this network discovery process was performed by sending a generic probe request for the broadcast (or any) network plus specific requests for every network in the PNL. This meant devices disclosed the full PNL in the air , exposing themselves to karma-like attacks , where an attacker can identify the hidden networks (or access points) the mobile device is trying to connect to and impersonate them, forcing the target device to connect to the attacker's network to capture its traffic and launch more advanced attacks. In order to avoid this vulnerable behavior, Microsoft released the Wireless Client Update (or patch) for Windows XP SP2 in January 2007 (KB917021) , changing the previous behaviour of Wireless Auto Configuration: "This update helps prevent a Windows wireless client from advertising the wireless networks in its preferred networks list." The new update mitigates the vulnerability, as the wireless device or client only generates 802.11 probe requests for the broadcast network, generically asking for the networks available in the area. 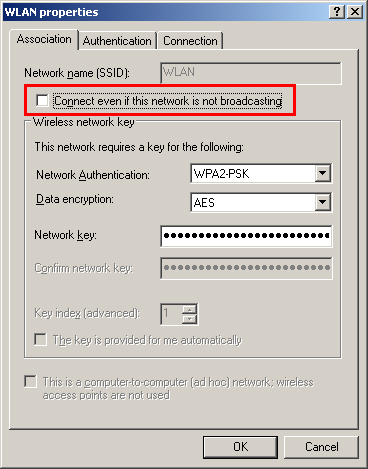 An exception to this behavior is presented by the existence of Wi-Fi hidden networks in the PNL: due to the fact hidden (or nonbroadcast) networks do not include their SSID (Wi-Fi network name) in the beacon frames, and do not respond to generic queries asking for any network available, the Wi-Fi clients need to specifically ask for these hidden networks, disclosing its name and existence on the device PNL. This makes devices vulnerable again to the aforementioned attacks. A similar configuration option is implemented in Windows Mobile. However, Windows Mobile 6.5 is vulnerable to an information disclosure flaw where the mobile device reveals its complete PNL every few seconds (30 or 120 seconds in the tests performed). As a result it presents (again) the old vulnerable behavior where 802.11 probe requests asking for the broadcast network plus all the networks available on the device PNL, hidden and visible, are revealed into the air. The expected non-vulnerable behavior implies the generation of probe requests for the broadcast network plus all the hidden networks in the PNL, but not for the non-hidden networks. 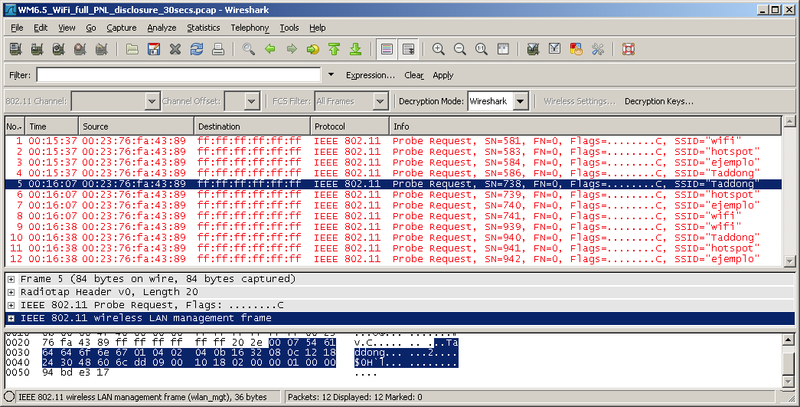 The images above show the generated 802.11 probe requests for the broadcast network, two hidden networks ("wifi" and "Taddong") and two visible networks ("hotspot" and "ejemplo"). This behavior can be used by a potential attacker to launch karma-like attacks . The vulnerability exists on the default configuration and there is no setup option to mitigate it or make the mobile device not vulnerable. We think Microsoft should release a software update to change this vulnerable behavior in Windows Mobile 6.5 and make the "This is a hidden network" configuration option effective, as it did with the Windows-based desktop operating systems . Due to the absence of a current or future software update, users must evaluate the contents of their PNL at any time. The only effective countermeasure against this vulnerability is to keep an always empty PNL, that is, the user has to actively remove the networks added to the PNL. This means the user must review the PNL and remove any new entries after finishing using the Wi-Fi capabilities every time she establishes a connection with any Wi-Fi network. If a single network is left on the PNL, the device will try to discover its presence and connect to it, and a potential attacker will be able to launch the karma-like attacks previously mentioned. This kind of attack is especially critical when the user connects to not secure Wi-Fi networks, such as open hotspots or WEP-based networks, enabling unauthorized connections to the mobile device. Unfortunately, Windows Mobile 6.5 does not have an equivalent option to the automatic connection switch available on Windows XP: "Connect when this network is in range". 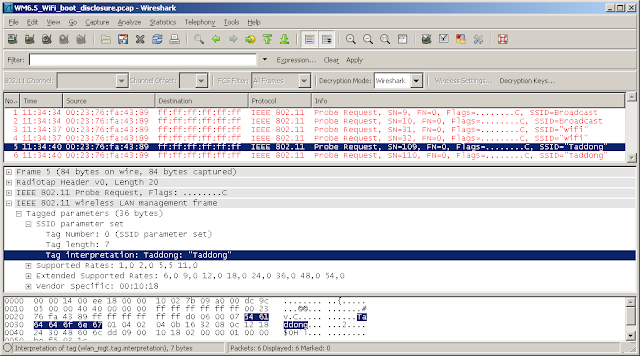 The security recommendation of removing all the hidden networks from the PNL, only allowing connections to not hidden or broadcast Wi-Fi networks, is completely ineffective to mitigate the impact of this vulnerability and the associated karma-like attacks (in fact, it is the main victim of this vulnerability). (*) Microsoft states Windows Phone 7 is not affected by this vulnerability, but this fact has not been tested and/or confirmed. "We have completed our investigations and can confirm that we saw the behavior reported by you on the Windows Mobile 6.5 phone. However, this issues constitutes a Low severity Information Disclosure issue which does not meet our bar for a security bulletin release." "As discussed previously during our investigation, we can confirm that Windows Mobile 6.5 does broadcasts the PNL. However, because of the low severity impact of the information disclosed combined with the fact that the attack would be untargeted (i.e. the attacker cannot force the mobile device to disclose the PNL), Microsoft would not issue a public security update to address this issue. Instead we would address this via next version of the product or service pack if it applies. As you've pointed out, this same issue was addressed on the desktop Windows platform via service pack described here http://support.microsoft.com/kb/917021. We also confirm that this issue does not exist in Windows Phone 7 when it releases." We at Taddong honestly believe this finding must be publicly known by the information security community in order to take appropriate countermeasures and mitigate the vulnerable behavior. Therefore, we have coordinated the release of this security advisory together with the vendor, following responsible disclosure principles. This vulnerability is especially relevant considering the extensive number of Windows Mobile 6.5 devices available in the market and the potential impact of the associated attacks. 2010-08-05: Taddong notifies the Microsoft security team about the vulnerability and sends a brief technical report. 2010-08-05: The Microsoft security team acknowledges the vulnerability report. 2010-08-20: The Microsoft security team confirms the vulnerability and notifies that an associated security bulletin or software update won't be released. 2010-08-23: Taddong notifies the Microsoft security team about the behaviour in Windows Mobile 6.1 (initial research was focused on Windows Mobile 6.5). 2010-08-23: The Microsoft security team acknowledges the vulnerability update. 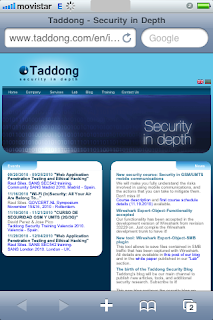 2010-09-01: Taddong publishes security advisory TAD-2010-003. "Trying to shut up your wireless chatty Windows". Raul Siles. 2005. "KARMA Wireless Client Security Assessment Tools". Dino A. Dai Zovi. 2004. "Description of the Wireless Client Update for Windows XP with Service Pack 2". Microsoft. January 2007. The contents of this security advisory are copyright (c) 2010 Taddong S.L., and may be distributed freely provided that no fee is charged for this distribution and proper credit is given. Last update: February 16, 2011 - Windows Mobile 6.1 is vulnerable too. See (UPDATE) marks. Windows Mobile manages Wi-Fi (or 802.11) wireless communications through the Wireless Zero Configuration (WZC) client or service, similarly to the equivalent Windows-based desktop operating systems. Windows Mobile keeps the previous Wi-Fi interface state during the boot process, that is, if the Wi-Fi interface was active during the last shutdown, it will remain turned on after the boot process; if the Wi-Fi interface was off during the last shutdown, it will remain turned off after the boot process. 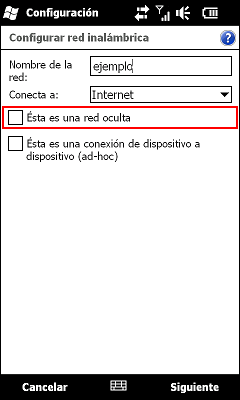 Unlike the mobile data capabilities (2-3.5G), organizations (and individuals) interested on disabling, or not using at all, the Wi-Fi capabilities of Windows Mobile-based devices can simply switch off the Wi-Fi interface and it will remain disabled unless the user turns it on explicitly. This default behavior is particularly useful in untrusted or "dangerous" locations, where the device owner does not want to disclose the mobile device presence while the phone is turned on (but its data wireless capabilities are turned off), presenting a completely silent profile. However, Windows Mobile 6.5 is vulnerable to an information disclosure flaw where the mobile device generates 802.11 traffic during the boot process even when the Wi-Fi interface is turned off. As a result, it generates Wi-Fi traffic in the form of 802.11 probe requests asking for the broadcast (or any) network, plus requests for all the hidden networks available on its Preferred Network List (PNL). 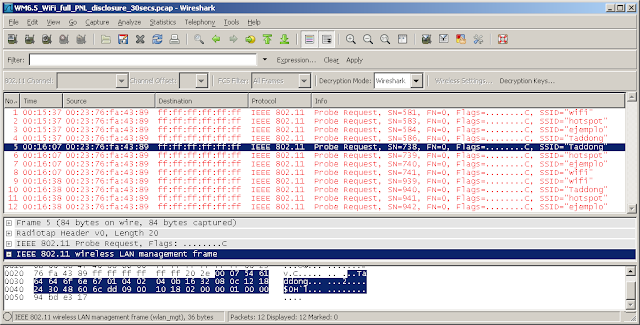 The image above shows the 802.11 probe requests generated for the broadcast network, plus two hidden networks ("wifi" and "Taddong"). The disclosure of the MAC address could seem low impact at first sight, as it is revealed every time the Wi-Fi interface is switched on. However, the impact is much bigger in very sensitive environments (defense, finance, healthcare, etc) where the Wi-Fi interface is always turned off, but other wireless technologies might be used, such as Bluetooth. Bluetooth uses the device address, knows as the BD_ADDR (Bluetooth Device Address), as a secret, as it is required to establish a connection with a non-discoverable (or non-visible) Bluetooth device. 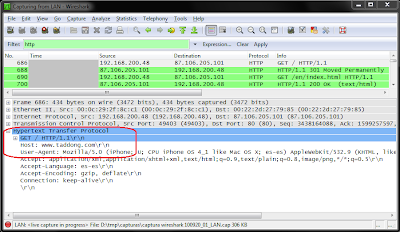 Some vendors (even outside the Windows Mobile world, such as Apple with the iPhone 2G & 3G) assign correlative or sequential addresses to the different wireless interfaces of mobile devices, such as Wi-Fi and Bluetooth. As a result of this vulnerability, the knowledge of the Wi-Fi MAC address automatically discloses the BD_ADDR of the mobile device, exposing it to undesired Bluetooth communications and attacks. The disclosure of the hidden networks available on the device PNL can be used to launch karma-like attacks . The mobile device discloses the hidden networks while trying to find and connect to these networks if they are available. An attacker can identify the hidden networks (or access points) the mobile device is trying to connect to and impersonate them, forcing the target device to connect to the attacker's network to capture its traffic and launch more advanced attacks. However, these karma-like attacks will only be possible if the Wi-Fi interface is switched on afterwards, so that the attacker can interact with the device wirelessly. The activation of the Wi-Fi interface will disclose the hidden networks (again), therefore, this vulnerability has the same impact as the one associated to configuring hidden Wi-Fi networks on the device. We think Microsoft should release a software update to change this vulnerable behavior and keep the Wi-Fi interface silent until it is turned on. Due to the absence of a current or future software update, users must evaluate the physical locations where their Windows Mobile-based devices are switched on. A potential attacker located around the target mobile device during the boot process (in the range of several kilometers or miles, depending on the Wi-Fi hardware available) will be able to capture the information previously mentioned. Additionally, users can reduce the impact of this vulnerability removing all the hidden networks from the PNL, and as a result, only allowing connections to not hidden or broadcast Wi-Fi networks. (UPDATE) Additional tests on Windows Mobile 6.1 confirm that this OS version is also vulnerable to this issue, disclosing the hidden networks contained in the PNL during the boot process like Windows Mobile 6.5. (**) Microsoft states Windows Phone 7 is not affected by this vulnerability, but this fact has not been tested and/or confirmed. We at Taddong honestly believe this finding must be publicly known by the information security community in order to take appropriate countermeasures and mitigate the vulnerable behavior. Therefore, we have coordinated the release of this security advisory together with the vendor, following responsible disclosure principles. 2010-09-01: Taddong publishes security advisory TAD-2010-002. 2011-02-16: Additional tests on Windows Mobile 6.1 confirm it is vulnerable to this issue.